WINK is a modern day parable of a nine year old boy being raised by his carpenter father who is sick and tired. Every day for the last 20 years the carpenter has visited the Well of Wealth and spent a dollar, believing that if he gives generously to the Well, it will give generously to him in return. On this day, the Carpenter is so unwell he is unable to visit the well, so he sends his nine year old son, Richard, in his place. Richard is entrusted with a treasured crumpled dollar, and sets off on his journey to the Well of Wealth. This fictional tale makes you think deeper as to the dynamics of wealth creation. The keys to wealth are in a story behind a story. To find the keys, you need to become better at seeing as "What you see is always what you get." Each reading will help you to discover more keys, until one by one, they will unlock the doors to your wealth. 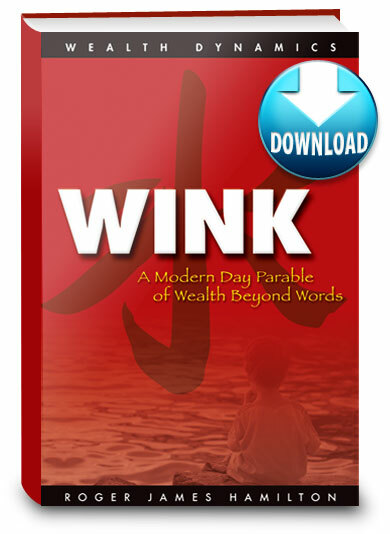 Click the button below to add the Wink | eBook (pdf) to your wish list.